Versatile Use to Light Kitchen Cabinets, Counters, Display Cases, Closets, Shelves, Accent Lighting, TV Back-light, Monitor Backlight, Video Production, etc. Lights can easily be mounted in 2 ways . Magnetic mounting needs no drilling. Metal pads are secured in place using high grade 3M two-sided tape. The lights with internal magnets will attach to the metal pads. Alternatively, lights can be mounted with secure brackets and 1/2" screws. All hardware is included. Additional extension wires of various sizes available for purchase. NOTE: When expanding the system do not exceed power supply ratings. 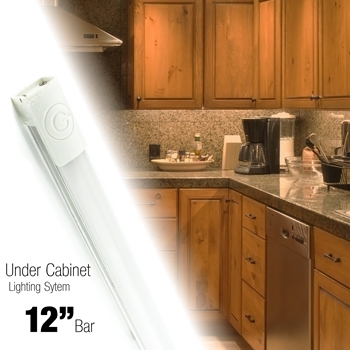 After buying some ribbon lighting from Cyron, I decided to buy this LED lighting kit to light underneath my cabinets. I can confidently say that I was not disappointed one bit, which is why I am coming back to leave a second review; something I NEVER do. The lights look amazing, highlight my cabinets perfectly, and are priced reasonably!